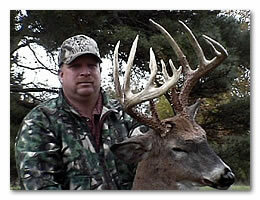 Kansas has long been recognized as one of the premier whitetail deer hunting destinations on the North American continent. We are fortunate to represent one of the premier hunting destinations in Kansas with over 4,000 acres of intensely managed farms where habitat and game management have proven to produce the kind of whitetail bucks that Kansas is famous for. This Kansas whitetail hunt takes place in the northeastern corner of the state with plenty of hunting opportunity available for the avid archery enthusiast as well as rifle and muzzleloader hunters. 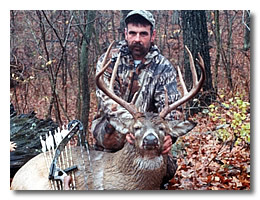 This is a semi-guided hunt conducted from elevated stands and tripod stands and ground blinds. Archery whitetail deer hunters enjoy the best of this area with very a liberal Kansas deer season starting in September and running through the last week of December. Muzzleloader hunters can hunt in late-September while rifle hunters have two 5-day hunts available post rut in early December. Your host for this hunt is the exclusive manager and Kansas deer outfitter of these farms who has personally set up the management program. His efforts have produced bucks harvested from these farms that score from 150 to 200 Boone and Crockett points. 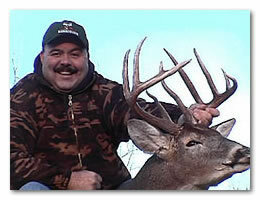 This is a great midwest whitetail hunting opportunity. Accommodations for this deer hunt are on location from modern facilities with that great mid western farm setting. 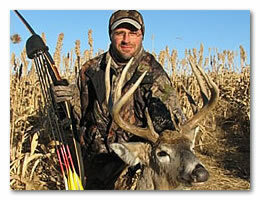 Licenses for Kansas deer hunting are issued by drawing, although success is normally 100%. We will assist you in applying for a license in April. 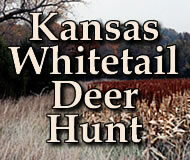 To reserve your Kansas whitetail deer hunt, contact us via e-mail or call us 1-800-487-0045.